Educating children is hard, and it seems that it is getting harder and harder to find the types of teachers who have the skill to tap into a child’s own interest in learning. Unfortunately, the traditional academic model of education sometimes squelches the love of learning and ends up leading some children away from academic pursuits. Here at Rainbow Chimes Early Childhood Education & Care Center, we are committed to developing well-rounded children who thrive in all aspects of their personality. We use the HighScope curriculum specifically because it incorporates activities that develop the following three qualities in children. Children are on a path of progressively increasing independence from the day they are born as helpless little infants until the moment when they emerge on the scene as independent adults. The path towards independence must strike the delicate balance between giving children too much freedom and too little. After all, you probably won’t have any trouble with your kids wanting to be independent and attempting to claim more independence than they are ready for. 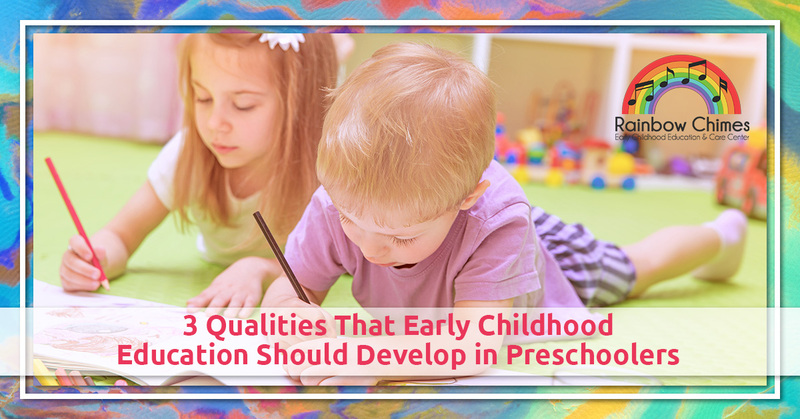 However, the chance to exercise age-appropriate independence is always a good step in early childhood development. You wouldn’t give your preschooler the option to independently choose to leave the building and walk down the street whenever they please, but you also don’t want to create subservient little robots who are unable to think for themselves. Structured play centers, appropriate choices, and games that promote independent thinking are great options for little children to begin to build their independence. Any parent who has had a child go through the phase when they endlessly ask “Why?” knows that children are naturally curious. However, if you’ve ever been in public and noticed the startling lack of curiosity on display among adults, you’ll realize that it’s not enough to take it for granted that children are curious. Curiosity is a trait that must be developed, fostered, and encouraged, or the conditions of life will tend to stamp it out. A curious approach to life helps children to see outside the box, ask questions that other people wouldn’t have thought of asking, and find solutions to things that others hadn’t even noticed to be a problem. Curiosity enables an individual to look deeper into something rather than just being satisfied with the surface level. An academic environment that stimulates curiosity is one in which there is always a rewarding discovery to be made by those who are curious. Have you ever been at a restaurant and got frustrated by your child’s seemingly eternal indecision over what to order from the menu? Decision making is a skill that takes practice, but there are things that help kids to not only become more decisive but also choose good decisions. One of the things that help kids to be more decisive is to learn to ask, “What criteria do I need to apply to this decision in order to make the right one?” At the preschool level, this looks like training kids to stop and be thoughtful about the decisions they are making and begin to be aware of the factors that play into whether the decision goes one way or the other. Here at Rainbow Chimes, we are committed to your child’s success. Schedule your tour today and enroll your child where they will grow and thrive.